Donna Spencer on the different ways to classify information (alpha, location, task, etc.). A nice pick up from Wurman’s 5 hatracks article. In the Chirp Developer Conference, Twitter finally added the two objectives that were missing: surfacing relevant and interesting stuff (promoted tweets, although marketing influenced) and co-locate similar items (Twitter annotations). I am really interested how the Annotations feature will take off. It could really extend the service beyond what we know of it now. From Jeanne C Meister and Karie Willyerd, guest blogging at HBR. The design research section of the IDSA now has a website. Also, the current issue of IDSA’s publication Innovation is jam packed with design research related articles. Cool! A good article with two really good videos explaining information architecture. Patrick has posted an article on file naming conventions. Good. Now I don’t have to hunt for them every time! The 2010 Intranet Innovation Awards are open for entries. Entries close on Friday 23. I like this award. It highlights how teams are thinking of making their intranets useful and productive. It starts a discussion on ideas and themes. I met some of the winners at the KM World conference in San Jose last November and I could clearly see their enthusiasm and determination in making their intranets work. I walked away with more than a few ideas to try out. I came back from work today to find my 6-year-old daughter in a bad mood. She was upset because Mommy told her that she got low marks in a math test! Surprised? Yes, in Singapore, reality hits early! I find it surreal that tests are given so early but I’m going along with it to see how all this works. So I’m biased over here. But that is not why I’m writing this post. I decided to write this post after what happened next. I picked up the math paper and it took me a while to figure out how to do the sums. I’m pretty sure it will take you a while too. 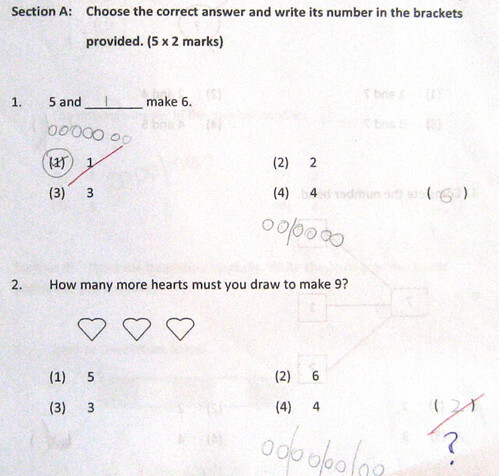 Here is part of the math paper. Were you confused? I was. The instructions are too complex and there are just too many distractions on the page. The sums are numbered, the options are numbered and then the answers too are numbers! And did you find the “brackets”? They are on the right hand side, a trick I guess to test the range of the eyes! See my daughter’s first answer in the brackets. Now see her second answer. Do you blame her for putting in the right answer in the bracket? Read the instruction, which number do I put in the bracket? The option number or the correct answer? The point of this test I gather is to help the student better ‘see’ math in abstract and concrete terms. That’s fine, but where does trickery come in to play? So, I took a shot at redesigning the paper and this is what I came up with in 5 minutes. I gave the same paper to my grumpy daughter and asked her to try the sums out. She looked at the paper and knew exactly what to do. She had a smile across her face. That is when I decided that I should share my concerns with the world. 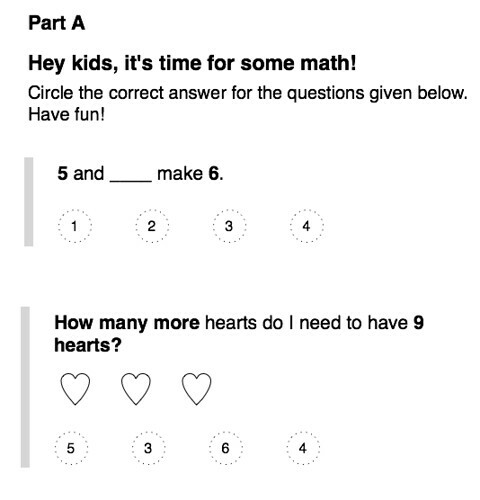 We live in a scary world where 6-year olds are asked to do such math sums. The least we can do is to motivate and encourage them to take on this challenge. Giving badly designed papers to these kids is such a cruel thing to do. So, if you come across papers like these then please do something about it.